Gluten-Free Heaven’s April issue is on sale now! This month we’re celebrating Easter with 101 recipes that are perfect for Spring, including pancakes, pizza and pound cake. Plus, we bring you all the latest free-from news, from ‘miracle’ bread-making to the coeliac testing process. Welcome to the Easter (and beyond) issue of Gluten-Free Heaven, featuring 101 recipes fit for early spring and, of course, the holidays. Included this month are fabulous ideas for food, craft and activities to keep you busy over the Easter period: we make pancakes 6 ways, create lamb dishes 7 ways, discover a ‘miracle’ bread-making course that uses gluten, but is still suitable for those following a gluten-free diet, learn about the process of testing for coeliac disease and put Easter goodies to the test (that was a lot of fun). There are all your regular recipe sections as well, including breakfasts, lunches, midweek meals, weekend dishes and sweet treats. From hot cross buns to cauliflower pizzas, and from pound cakes to smoked duck quiche, there are plenty of fantastic dishes for you to get creative with this month. Have a great Easter, just don’t eat too much chocolate (or do)! 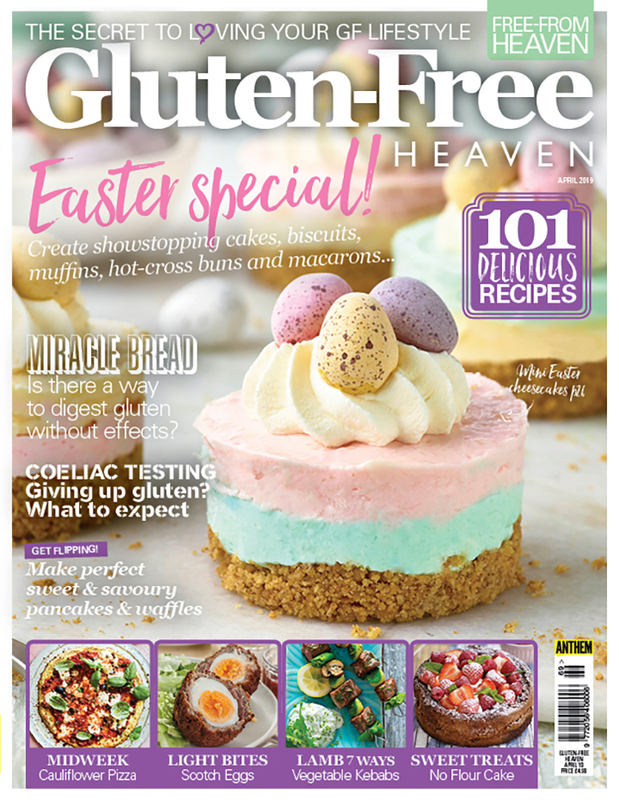 Pick up your copy of Gluten-Free Heaven at Asda, Morrisons, Sainsbury’s, Tesco, Tesco Extra, Co-op, Waitrose, M&S, WHSmith and Easons, or order online from us here. You can also download the digital edition here. Don’t forget to visit our social media pages to get involved with your free-from community on Facebook, Twitter, Pinterest and Instagram to join in on all the gossip.